Reincarnation is one of the mysteries in life. How can we explain the 'conservation" of spiritual energy?. By the mechanism of Pelastration Spirit and Body are coupled to each other in a new human holon (holon: a new 'island' that is a new manifestation of coupled previous hyperspaces or parent holons). 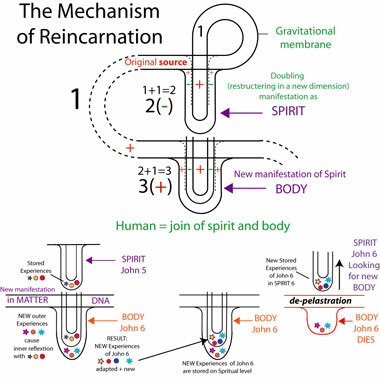 To understand the LEARNING PROCESS related to reincarnation it is important to understand how knowledge and consciousness happen. Knowledge and consciousness are explained in another webpage. The webpage on the paradoxes is also important to understand and 'see' the mechanism of the unbreakable membrane. 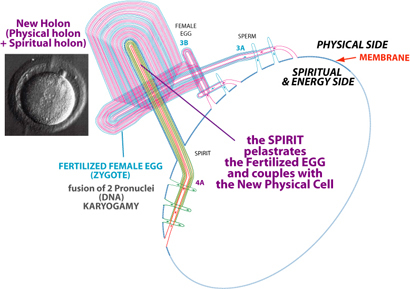 The Spirit penetrates inside the Material level which is offered by the DNA structures brought together by the male (father) and female (mother). This image is thus simplified. In next image we see how the Mind has pelastrated the zygote (fertilized egg). You can find more on the page on Life about this coupling of Spirit and Body. 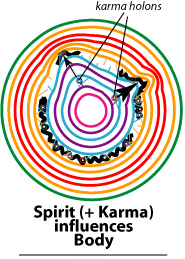 In Buddhism the spiritual layers are called koshas or kosas. In Hinduism we see similar sheaths (vijnanas). We see that also matter has similar layers. The Spirit has stored in it's layer(s) a number of previous experiences. These are incorporated inside the new body ... and they will also influence the properties of the body. On this image we see how karmatic holons ( sub-holons stored in the spirit holon caused by actions in previous lives) influences the topological properties of the body holon during it's growth and functioning. If there is a large wart or ring on the index finger, of course on that spot the surface of the glove will increase (deformation). Karmatic holons will influence the body structures and systems, and the mind (perception, analysis, synthesis, emotions, etc.). During our life these "previous" experiences are adapted by the new experiences in our actual physical and psychological world. This happens identical like the storage of knowledge. Finally when we die the coupling between body and spirit stops and the spiritual holon becomes free again but will contain inside all new (and adapted) information gathered during the past life. Of course these new experiences can be positive and/or negative. First remark: this is a simplified image. What is designed here has one center. But in humans this center will contains much more layers of higher spiritual qualities. The Spiritual holon of John 5 has in the has a number of internal spiritual sub-holons (symbolized by: green star, yellow hexagon, red circle) which are internal couplings of that membrane. This happens like knowledge is stored. Then John 6 concepts by the combination of the DNA of the two parents. 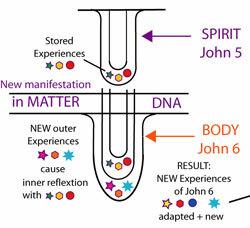 The moment of the conception the Spirit of John 5 couples with the matter instructions of the DNA. A new human holon called John Smart is started, and grows. During his life JOHN 6 has a number of experiences (pink star, orange hexagon, blue heptagonal star) which will be reflected with his inter-knowledge of the previous lives. At the end of his life John 6 has a new spiritual structure: yellow star, red hexagon, dark blue circle and light blue pentagonal star. When John 6 'dies' his matter body returns back to material sub-parts and the spiritual body (holon) John 6 has back it's independent unity. 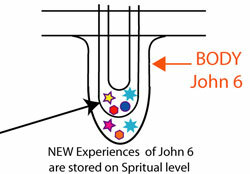 This spiritual body John 6 is however not identical to the starting spiritual body John 5 since inside a number of the pelastratic sub-holons in the spiritual membranes were adapted or new ones were provoked by new life experiences (love, hate, crime, pain, punishing, pride, fear, meditation, community service(s), prayer, healing, therapy, insight, contemplation, responsibility, etc.). Therefor we can correct 'this life' a number of unbalancing things we may have done in previous lives, but alos we can enjoy the benefits of previous deeds. Having the insight in our possibilities, change our lives in the appropriate way and transcendent to a higher consciousness can free us from such troublesome factors (suffering) in our mind and body. We have all our private path and function(s) in the Unity of Interconnectedness. 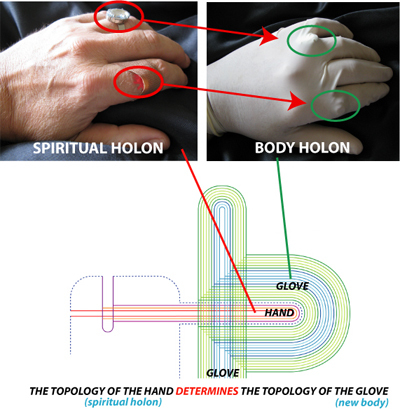 During life the spiritual holon (containing also the sub-holons of previous lives) is surrounded by the material layers of the body holon, like a hand is covered by a (new) glove. Next youtube video explains how a new human holon (Body + spirit) grows, how the environment creates sub-holons (structural memories) inside the spiritual holon, and how on dying the body holon decays releasing the spiritual holon which still contains it's karmatic sub-holons. Next "life", on reincarnation, the old spiritual holon couples with a new body (glove). 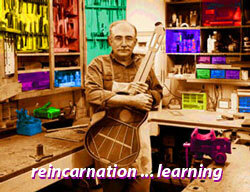 The topic of reincarnation is also touched on this webpage.